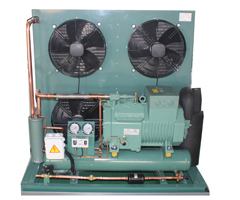 1) Bitzer semi-hermetic compressor, good quality and reliable performance. 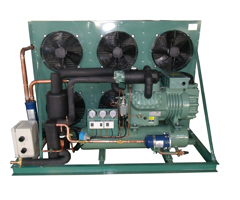 2) Condenser in copper tube & aluminum fin or in tube and shell of high efficiency, high heat exchange efficiency and long life span. 3) External rotor fan in good outlook with low noise and high efficiency. 4) Use domestic or imported accessories in good quality, with complete configuration, and reliable performance. 5) The units have waterproof terminal box, in which all the control parts are connected into, easy for the user to connect wire. 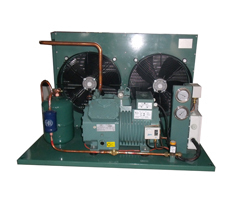 6) The product is in series, and suited for the wide range of temperature for the refrigeration equipment in fresh-keeping, refrigeration, ice make and refrigerated water etc. 7) Specification is as the PDF file.